Your artwork is unique to you and, after consultation with you about your tastes and the environment in which it will hang, we will be able provide the most appropriate frame, mount and glass to meet your needs. Our default standard of framing means all our work is reversible; your art can be returned to its original state. We use techniques and materials that will not cause harm to your possessions. You are welcome to call in and discuss what the various framing standards mean and the impact any of them can have on your art. All our pricing and quotes are obtained from our computer based pricing system; you know you will always be given consistent information with no confusing prices arrived at out of thin air! 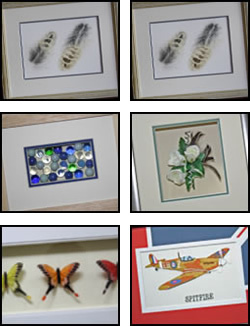 Paintings – Photographs – Certificates – Posters – Medals – Baby’s First Shoes Sports shirts and other memorabilia – Needlework – Collectable 3D objects – Mirrors. We have a Wizard e8500 computerised mount cutter; this provides us far more design options for bespoke customers and the ability to react quickly to larger orders for pre-cut mount boards. In our workshop we also have a heated vacuum press. This can be used to prevent non-valuable artwork from wrinkling in a frame and for encapsulating low profile items, a great example is to laminate an autumn leaf to preserve its colour.